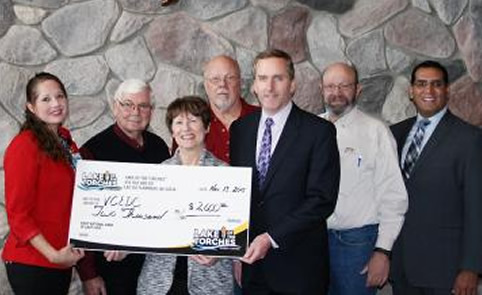 Lake of the Torches Resort Casino presented members of the Vilas County Economic Development Corporation with a $2,000 donation to assist the organization in promoting county-wide sustainable economic development. he check presentation occurred as part of the VCEDC’s Nov. 13 Board of Directors meeting held in the casino’s Hall of Nations Convention Center. The corporation will use the donation to help in its mission of providing expertise and financial assistance to new businesses and entrepreneurs who are starting new enterprises in Vilas County. “Lake of the Torches’ continued cooperation with the Vilas County Economic Development Corporation has again demonstrated how collaboration can make a difference supporting entrepreneurs and businesses in our economy,” said Carl Ruedebusch, Chairman of VCEDC. The VCEDC is a public-private partnership that offers mentoring and investor assistance to aspiring business owners interested in starting a business venture in Vilas County, often through two business incubators in Eagle River and Manitowish Waters. These incubators offer commercial and industrial space for businesses at a nominal rate, and VCEDC members offer their wide variety of business expertise to these new owners to successfully grow their business. In addition, “The Entrepreneurial Venture,” a collaboration between the VCEDC and Nicolet College, is a 13-week program to help existing business owners and new entrepreneurs. The program had graduated more than 65 students since its beginning and 15 in 2015 thus far. Additionally, the VCEDC helped procure $230,000 in grant money to increase broadband access provided by SonicNet, CenturyLink and ChoiceTel in 2015. Increased broadband availability allows businesses the ability to better reach customers and conduct day-to-operations in an economy ever more dependent on the Internet. Four additional broadband applications were submitted to the Wisconsin Public Service Commission to obtain grants for use in 2016. “We are glad to continue a productive relationship with the Vilas County Economic Development Corporation in promoting a healthy and sustainable economy that is beneficial to all of us here in the Northwoods,” said Lake of the Torches’ Director of Marketing Leana Schlecht. 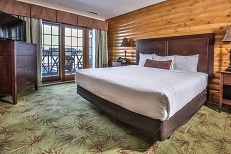 Situated on the shores of Pokegama Lake and nestled in Wisconsin’s Northwoods, the Lake of the Torches Resort Casino has a feel of a classic Northern retreat and reflects its Ojibwe culture and heritage. The casino has over 800 slot machines (including a non-smoking area), seven blackjack tables, a three-card poker table and three Texas Hold’Em poker tables along with Roulette and Craps tables, a high-stakes Bingo Hall seating up to 500 persons, the Woody’s Bar and Grill and the Eagle’s Nest Restaurant. The hotel has 101 well-appointed rooms, the Dancing Waters Lounge and the Woodlands Oasis pool area. The 8,500 square-foot Convention Center with the Hall of Nations offers an outstanding venue for entertainment, receptions, trade shows, meetings, presentations and seminars.